These photos mostly reside elsewhere, on remote servers -- parts of various museum or gallery collections which you may explore. But to follow this subject of Native clothing and regalia, return here with the BACK or HISTORY key (from NetScape's GO menu). If you find good illustrations of clothing, regalia, or footgear not included here, please notify me. Bookmark the page where you saw it, and send me the URL of that page, so I can link specifically to it, rather than to larger collections that contain it. Quilled shirts, moccasins, Inuit sealskin highly decorated outer parka--Glenbow Art Museum (Alberta, Canada) collection. Beaded Plains moccasins (Glenbow)--These were made (around 1890) by the Lakota mother of J. Wounded Horse, Wood Mountain Reserve, Saskatchewan. The family is descended from Sitting Bull, they were refugees to Canada after the defeat of Custer, and Sitting Bull's assassination by the U.S. government at the Standing Rock reservation. All Roads Are Good: The National Museum of the American Indian (NY)--This exhibit page is actually a museum book, with a few pictures and a few paragraphs from the long essays written by Indian people who were asked to select museum exhibits that meant something to them. The three exhibit books produced by the new museum are good educational resources, available from them and at some bookstores. The small beadwork closeup forms the book's cover, and is a detail from a photo of a 19th century box-and-border Lakota robe, that was beaded, rather than (as usual) painted. Haida Hat--Cherokee Lloyd Kiva New, says "my appreciation for the beauty of the Northwest Coast hats that I have chosen to illustrate my views inspires me to think more about the role of the arts, both as mirror and goad, in the lives of Indians as they go about the reshaping of their culture...The Indian sense of beauty and design can serve as an inspiration to artists from anywhere in the world." Box & border deerskin robe--Selected for commentary by Emil Her Many Horses (Lakota) this ?19th century robe is beaded rather than painted. Emil says it may have been made for a giveaway or to call out a person for some special honor, such as society membership. Usually, Emil says, this type of robe is painted, not beaded. A detail of its beadwork is used on the cover of the Museum book of essays, All Roads are Good. Oneida Traditional Dress of trade cloth--Oneida Sherri Begler made this women's dress, of trade cloth, with black velveteen skirt and leggings. The collar is finely beaded, and so is the edge and hems and seams of skirt and leggings. Ms. Begler made the trade cloth top to show a smooth transition of Oneida people to use of new materials -- trade cloth -- to replace what would have been a traditional deerskin overdress or tunic.Because the Iroquoian people encountered the white so early in trade, this stylle of dress, replacing skins with cloth, became common, as men began to spend much time trapping beaver for trade, rather than hunting for subsistence. Traditional 6-Nations (Iroquois League) Kostoweh, or Chief's hat.--The kostoweh leather cap is suspended from an ash-splints frame, decorated with turkey feathers. The deer horns make it a traditional Iroquois League Chief's hat, symbol of office. Clan mothers named chiefs, and could remove them for malfeasance of office. This was called "de-horning" and literally meant removal of the horns from the hat, or taking the hat (It has been done in recent years). This kostoweh was made by Oneida elder Ray Elm (who may be the oldest living Oneida). A detail shows the fine blue-and-white beadwork border, which copies a wampum chain pattern that shows unity of the people under the leadership of the League of 6 Nations. Museum-quality cornhusk dolls,-- by Oneida elder Emily Johnson, dressed by Oneida Gloria Halbritter show a man's traditional hunting costume of deerskin shirt and leggings, while the woman doll is wearing a post-contact long calico dress, a 19th century missionary-introduced fashion. Oneida (NY) Tribal Textiles -- A custom-screened T-shirts tribal business venture. Here's a pictorial essay about the art and meaning of Chiapas highland Maya weavers' brocade weaving of huipili. The pictures (for now) reside on the Science Museum of Minnesota's Mayan exhibit server. See credits at the end of this page for more info. This page will ultimately become part of the multipage MayaPages section here on a page of its own, using some art that will reside locally. Use your BACK key to return here after viewing each image. Traditional Mayan huipil -- elaborate brocaded weaves done on outdoor backstrap hand looms -- are still worn today among the Chiapas Maya villages of the southern Mexico highlands. (Other Mayan people do the less-demanding embroidery on garments for women and men.) The huipil is a rectangular outer garment, centered with an intricate brocade-woven cross-shape covering the arms, front and back. It embodies symbols of the cosmos -- world, sky, spirits. "Nichimal" or "flowery" is the Tzotzil word for beauty. A huipil depicts the earth as the spring rains fall and flowers burst forth. A woman wearing one she has woven with vision and prayer is in the center of the flowery universe of space and time. She feels this, wearing her huipil. When she puts her head through its central hole, she is the axis of the sky-cosmos and the infinite underworld of the Earthlord, who controls weather, the dead and meritorious spirits of ancestors (who become stars). The universe of sacred space and time radiates from her head, across her arms and down her body. The patterns and meanings of huipili nave not changed since the classic Maya period. They are shown on stone carvings of the abandoned, ancient jungle cities. Chiapas Tzotzil Maya master weaver Rosha Hernandez at her backstrap loom.--Mayan women of the southern Mexico Chiapas highlands who weave cotton cloth and the traditional yarn brocades for huipili tie one end of the loom to a tree outdoors, unroll the fabric and lean forward and back against the loom waist belt to control tension in the weft threads, a technique formerly used by Hopi weavers. Chenalho Mayan Weaver Spinning YarnThe base fabric of all village clothing is cotton, grown in the lowland valleys. Since sheep (called "cotton deer") were introduced by the Spnaiards, they have been prized for wool (they are considered sacred and not eaten). Here a weaver is spinning thread, with a round stone weighting the vertical spindle, drawing out the thread from a puff of combed cotton in her other hand. It takes as long to spin the yarn for weaving as to do the intricate brocade weaving itself. Zinacantec Weaver using warp board -- Fabrics for huipili and some other garments are not tailored from finished cloth, they are woven to size. Here a weaver stretches starched thread of black onto a warp board where she can group warp threads of several colors --she's also using white -- for striped cloth,or use plain white warp for a huipil, or plain black for some men's religious garments. Starch helps to hold the threads of the warp into the "up and down" groups (called sheds) that are separated for each passage of the single cross-wise woof thread and the placement of the many colored yarn threads which make up the brocade woven above the cotton fabric base. The weaver cannot weave outdoors when it is rainy, and her starched threads mean she cannot weave when it is too humid either. Black sheep are especially prized, because their wool can be dyed (with mud and herbs) to a glossy, waterproof black. San Andrés Grand Design--The grand design of the largest part of the hupil (the bodice, neck-border, and sleeves have different traditional designs) represents time. The sun pausing at zenith is symbolically represented as a grand diamond, with the 4 sacred directions smaller ones. East (dawn) is above, West (evening) below. Pattern repetitions across the row means the sun passing across the sky, under the earth (which is metaphysical not just underground), and re-emerging at dawn the next day. Smaller butterfly-wing diamond-spirals and dots symbolize the sun's flight which is not the same, day to day. Eastern and western sea-horizons are symbolized by indigo blue threads Bright dots, alternating side to side, symbolize summer and winter solstices (longest and shortest days). A thin line between rows marks the "overworld - underworld" or day and night passage. Some weavers change color on 18th, 20th, 19th and 5th rows, marking the 18 months of 20 days and the 19th month of 5 ceremonial New Fire days that comprises the ancient Mayan Calendar. San Andrés Earthlord Design--The Earthlord is a powerful spiritual being who controls the realm of the dead who have lived good lives and complete certain tasks after death. Though ceremonial offerings are made to him at sacred caves, his realm is metaphysical. He also controls weather, rain, wind, vegetation, and his daughters spin cotton into clouds--the reason plain white cotton always edges the cross-shaped brocade patterns of huipili is to represent the clouds. All women who weave huipili are daughters of the Earthlord. Chenalhó Toad Design--Toad is the Earthloard's shaman. When he sings, Earthlord's daughters fluff and spin cotton for rainclouds which are released in the daily thunderclouds that pile up and rain around the peaks where his sacred caves are located. Toads and flowers are closely associated in the ancient myths. It is said that brocade weaving was discovered by a woman who examined red spots on a cave toad's back. Zinacantec Weaver at her loom--Different villages use different colors and variations on the traditional patterns (the myths differ somewhat too). Each weaver has her personal brocade signature, which she weaves around the bottom edge, or sleeve band, or neck of her huipili. But experienced weavers can tell what village a huipil comes from just by looking at the patterns. Magdalenas Weaver making an intricate brocade--The brocade is built up slowly with third threads of several colors that dangle below long warp thread groups and crosswise weft thread. The colored yarn is pulled across certain warp thread groups on each row. The threads for the row are then pounded tight with the wooden batten. A good weaver may complete an inch (or less) of brocade cloth in a day, although she begins weaving only when her early morning cooking and cleaning are done, and quits when it begins to rain in late afternoon. It would take as long to embroider a huipil as to brocade-weave it, but embroidery can be done at many times when weaving cannot. Too, busy women such as those in the potters' villages use a long "lazy vertical" stitch which is later tacked down by sewing machine; these patterns are colorful but most of the intricate symbolism can't be represented that way. Rosha looks at feather huipil--Feather weaving was an Aztec, not Mayan, art. But Aztec troops were used by the Conquistadores, and the art of feather-weaving was picked up by a few women. In Zinacantran. it survived for centuries after being forgotten by the Aztec tribal survivors. White fluffy chicken feathers are used, and the feathered brocaded huipili are used for wedding garments. Few women can afford to buy (or the time to make) one just for this purpose, so mostly they are rented just for the wedding. Here, Rosha Hernandez and other Sna Jolobil (village weavers' collective and study group) examine the process. Sna Jolobil rediscovers ancient dye and pattern techniques, maintains standards, provides some training, and tries to maintain a textiles market, so the weavers, not middlemen, can profit from their work. Chalchihuitan Huipil--This huipil is done in the old style which preserved techniques and patterns for 1,000 years. After the conquest, priest wanted statues of the saints dressed in cloth as was then the European custom. (Ancient Mayan temple sculptures had been similarly dressed in elaborate brocades). Women wove brocade huipili and men's tunics, sometimes using a fine silk brocade as clothing for statues of saints (some life-sized) which are taken around at festival processions. Layers of these saints' garments have been continually available for the weavers to study for 500 years, and preserved patterns, techniques and meanings for 500 years of survival under cultural attack. Man's Cotton Shirt--Cloth for everyday garments is of course not so elaborate, but is still made beautiful, sometimes by embroidery, sometimes by woven bands less complex and time-consuming that the brocaded weaving done mainly for huipili. 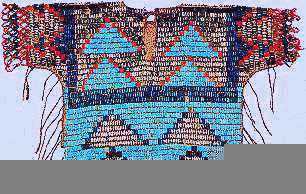 Traditional Andean Textiles--Jackets, mantas, and small items, woven or embroidered intricately. Some of these garments and blankets are for sale. The pages also contain information about traditional and ancient cultures of the Quechua and Aymara peoples of the Peruvian and Bolivian mountains, the environment there, and Llamas -- mountai animal whose wool is used for cloth, and which carry light burdens for the mountain villagers. CREDITS: : The logo of these art pages is "Two Fish" by Manitoulin Island Ojibwe-Odawa Martin Panamick, as explained in the Art Contents Menu page credits. PAGE LOGO -- Intricately cut, woven and beaded buckskin shirt by an unidentified Northern Great Plains artist, late 19th century. Collection of the Glenbow Art Museum, Alberta, Canada, whose opening page has a lovely big photo of it, but no more info. SMALL PIX: Each of these is a reduction from the museum exhibit it serves as a clickbutton link to; sometimes more information about the items is given on their own pages, often I've supplied it from my own books and knowledge. MAYAN WEAVING:now is illustrated only by photos taken by Jeffrey J. Foxx used at the Science Museum of Minnesota's interactive Maya web site. I have drawn heavily on the beautiful book Living Maya by Walter E. Morris, Jr. and Foxx. Harry N. Abrams Inc, NY: 1987. This book was the result of Morris spending more than 10 years among the Chiapas Maya, where he learned the Tzotzil language and made many friends. It shows their daily life, legends and myths, symbolism, and overall istory back through ancient times, as well as Foxx's beautiful photos, and many drawings by local artists. This photo is a reduction of one linked to above, a Mayan spinner, who is accumulating white cotton thread around the stone-weighted spindle in the foreground. Though the book had many financial sponsors, the Science Museum of Minnesota's anthropology director, Louis Casagrande, was instrumental in working with Morris and Foxx to organize many Mayan exhibits over the years, including the construction of a replica mountain thatch-roofed hut in the main hall, part of the largest exhibit. The Museum brought Zinacantecan Mayan elder and curandero Anselmo Perez to Minnesota in 1986 to dedicate this house and attend an honorary banquet, and there have been many other contacts and travels. Until the recent Canadian Museum of Science exhibition in conjunction with the feature film about the Mayans created jointly by Canada and Mexico, Minnesota had the best north American collections and exhibits that cover Mayan daily life, not just archaeology, and this may still be true. It is a valuable local resource for schools and teachers interested in the beauties and mysteries of this ancient indigenous civilization many of whose modern descendants are exiles and refugees in the U.S. For those who cannot visit, the Morris book is an invaluable educational resource, a good read, and though beautiful enough for a coffee-table status symbol, should not sit around there, but be looked at and read. Explanatory text and graphics copyright 1995.